Harnden will be exhibiting at INTERPLAS 2002 at the NEC in Birmingham (UK) later this year. Our stand number 5114 will be located in Hall 5 where we will be demonstrating Harnden PP Series III machine, our technical staff will be available for discussions. Seven years ago, Harnden introduced the PP range of bag making machines. Now available in any of three standard widths (1000mm, 1250mm, and 1500mm) Harnden have announced the new Series 3 specification. These offer an even greater range of functions, facilities and features, several of which will improve Harnden's already well-established reputation for reliability. 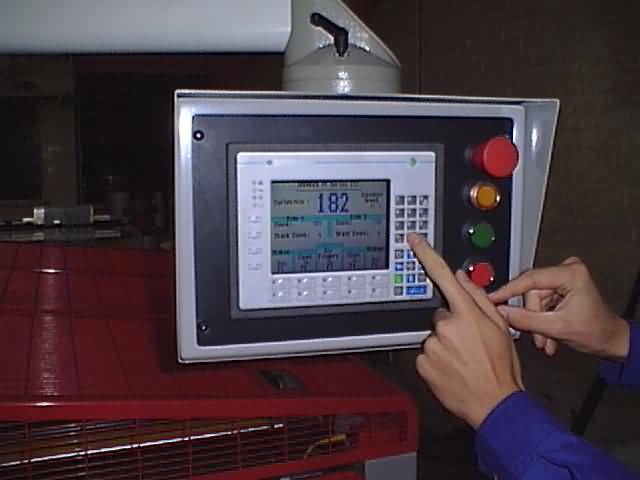 One such refinement is the new, simplified computerised control system, consisting of a high-speed processor, to give instant response to commands, rapid precision movements for more accurate control of the actual bag making process (particularly the welding action), high-performance digital servos and a brand new colour screen for enriched human/machine interface. Other new features include the way that set-up parameters, such as draw length, weld time, pick off timing, print register, pulse output timing and registration can all be changed 'on the fly' and also stored in memory. All our machines include this job save facility which can be used for repeat orders. It only requires the operator to select the product reference number and all key settings are made automatically. This enables the user to optimise the running speed to suit each individual job. On the mechanical side large diameter draw rolls and a more robust centre section lend themselves to increased machine throughput, while quieter bag retarders and improved guarding make for better operator comfort and safety. Harnden regularly work closely with users to customise machines for special applications, customer satisfaction is the key to any business, some of which have been completely unusual and unexpected. Many such customers have used their ingenuity and inventiveness to develop niche markets for themselves, so are reluctant to disclose their ideas to the rest of the world. Harnden acknowledges and respects this confidentiality but, at the same time, would like it to be known that the company are always receptive to any approach for help in tackling new markets. The cumulative effect of all the improvements to be found on Series 3 is a machine that is more robust, easier to use, simpler to maintain, more versatile than ever before, and yet, thanks to it being simpler to build, has not seen the cost become excessive. The company fully expects its latest Harnden series to become the 'Machine Of Choice' for the production of most popular types of plastic bag.